That famed quote by Mark Twain in a letter he wrote in 1897 is something that popped into my head on the drive back home to Indiana recently after visiting Liberty Outdoors’ facility in Somerset, Pennsylvania. For after the split of Little Guy Worldwide (now Liberty Outdoors) with longtime manufacturer Pleasant Valley Teardrops (now nuCamp RV), a lot of people left the Little Guy team for dead. Destined to become more than just a teardrop marketer, Little Guy entered the arena of manufacturing, something quite new to them. 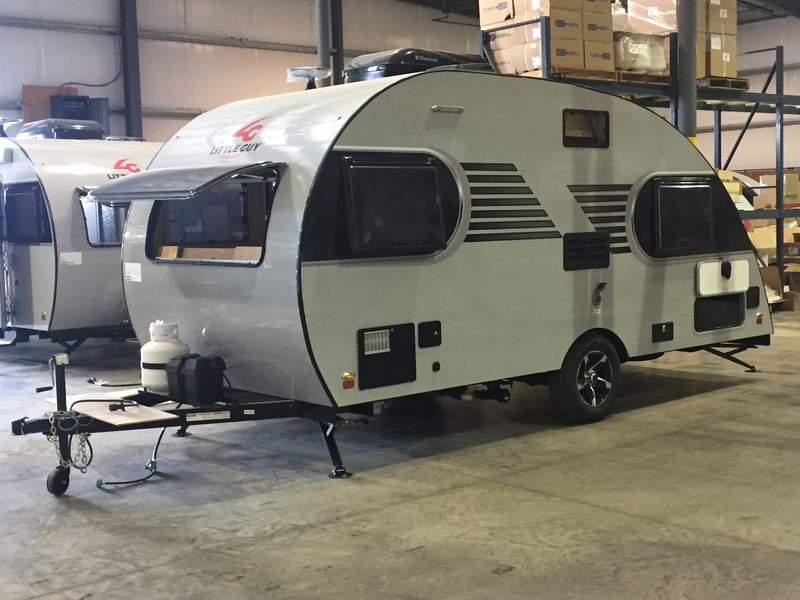 With the recently acquired rights to the Serro Scotty brand, Little Guy formed an alliance with Gulf Stream to manufacture an “everyman’s camper” in the Serro Scotty. 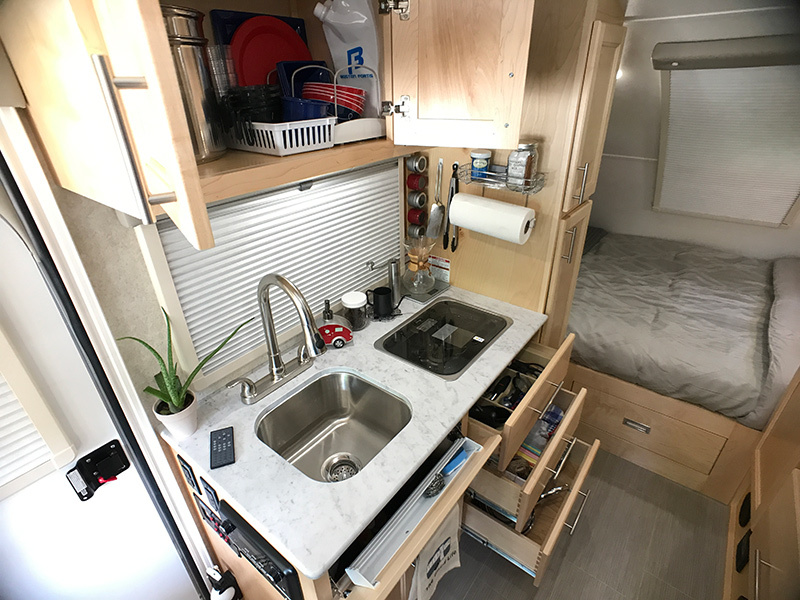 The Scotty took a beating on the internet, and especially in the vintage Serro Scotty community, due to its perceived lack of styling with its standard travel trailer boxiness prevalent in the industry today. Little Guy assured everyone that this was just the first wave, and more products were yet to come that would be more in line with their roots that they would manufacture themselves. Fresh from their own plant in Somerset, Pennsylvania, comes the Little Guy Max. The Max is just the first of many new lines you’ll be seeing coming out of the plant in Somerset over the next two years. 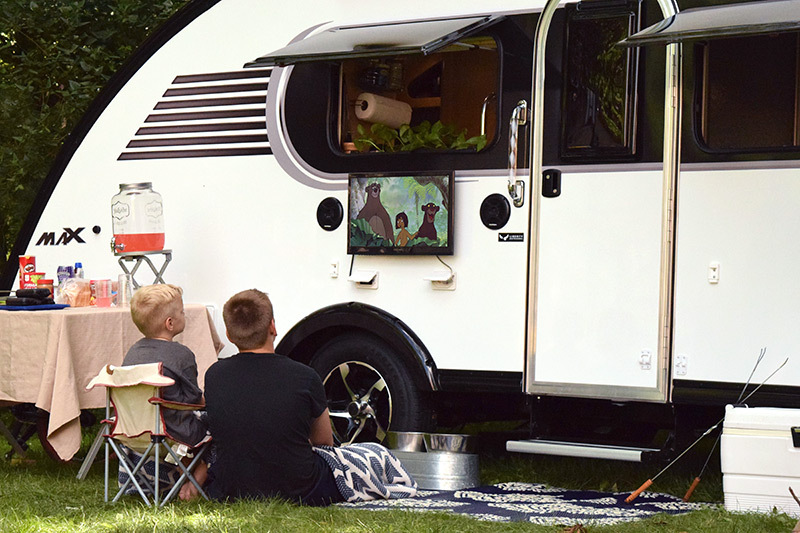 And based on my first hand observations of the Max last month, the product offerings from Little Guy will undoubtedly set the small trailer community on its ear. But until then, let’s first take a look at the Max. I met Little Guy Director of Operations, Dylan DeHoff, at the Liberty Outdoors Somerset plant one Wednesday morning last month. 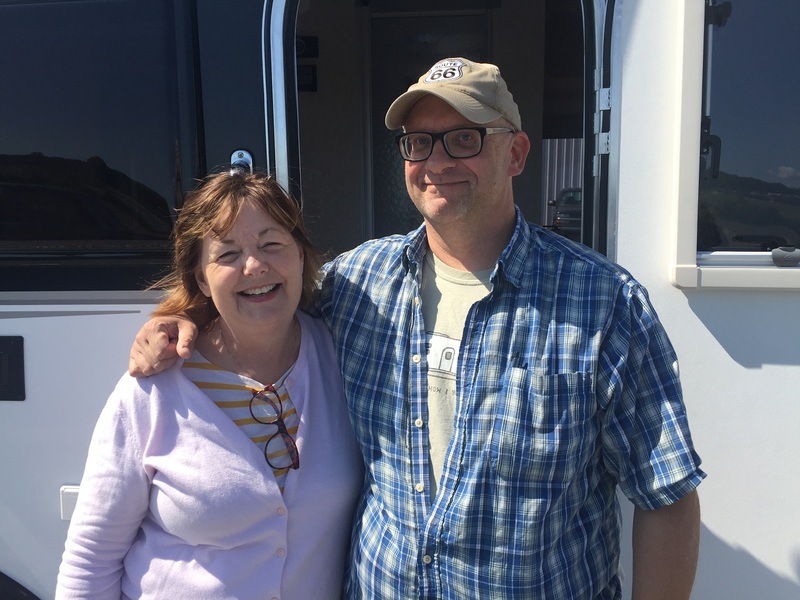 Along with Dylan to meet me was a celebrity in the world of camping podcasts, Janine Pettit of the Girl Camper podcast. 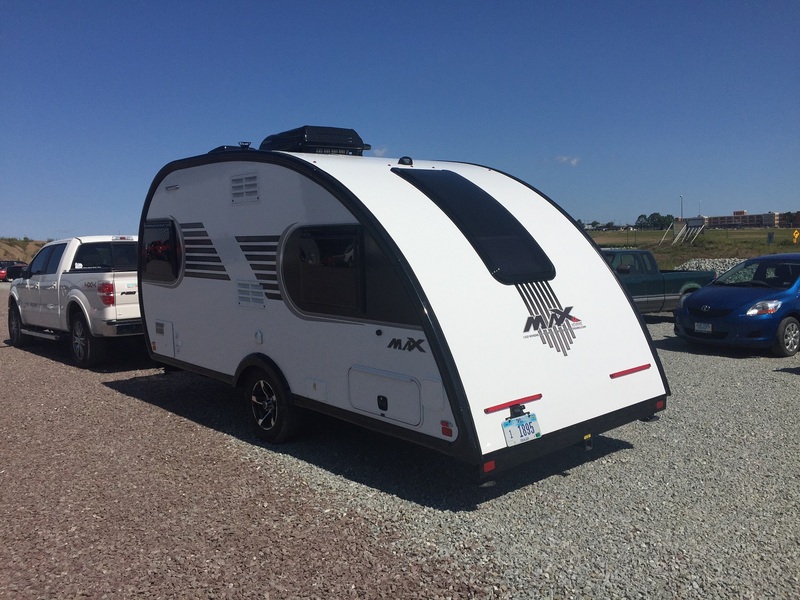 Janine was lucky enough to be taking the 3rd Max built back to her home in New Jersey, as she was going to do some hands on critiquing of the Max for Little Guy on a 4 week trip out west starting this month. Janine and Dylan took me on a tour of hers before she took it back to New Jersey. 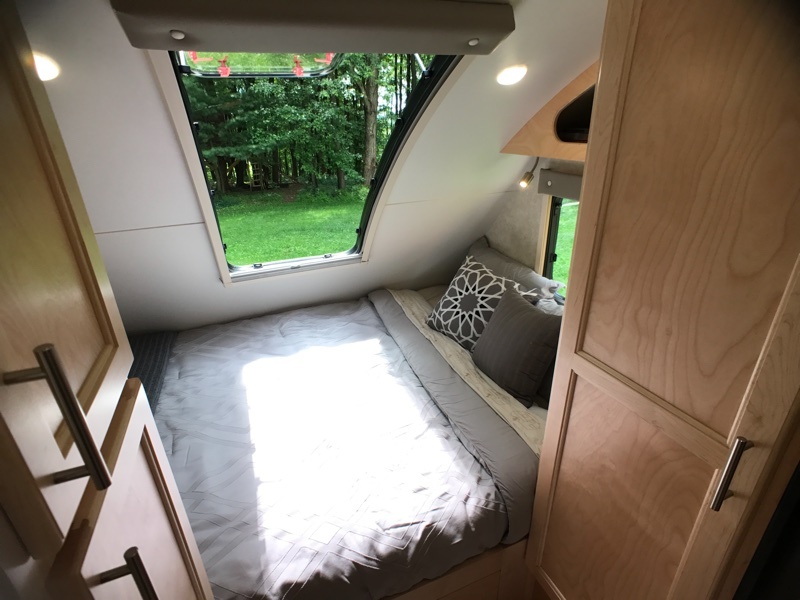 The first thing you notice when you first step into the 21′ Max is the incredibly open feel, due in part to the seven dual paned windows throughout, including a window in the door that opens up for additional airflow. 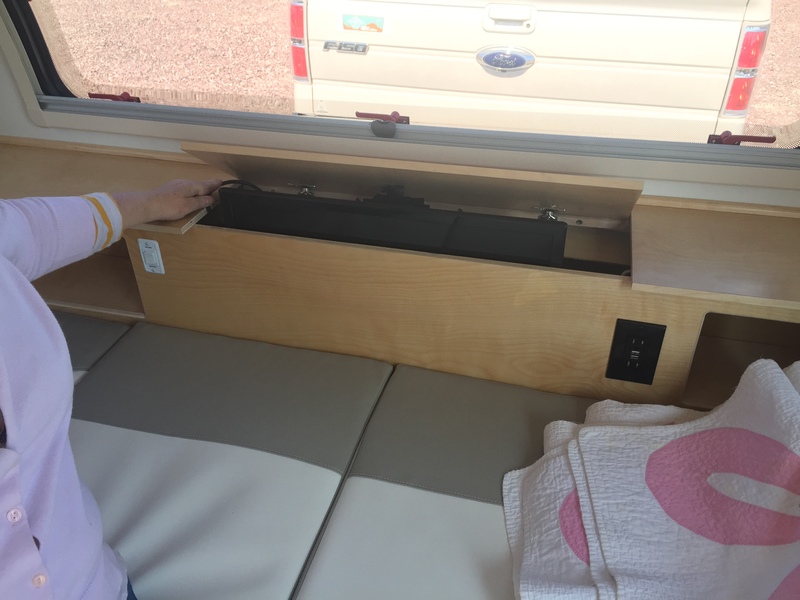 There are also two windows in the rear of the Max that also open, including the vertical window above the spacious 60″ x 80″ queen bed, with a mattress locally made exclusively for Little Guy. If there’s one word that really defines the Max it would have to be space. 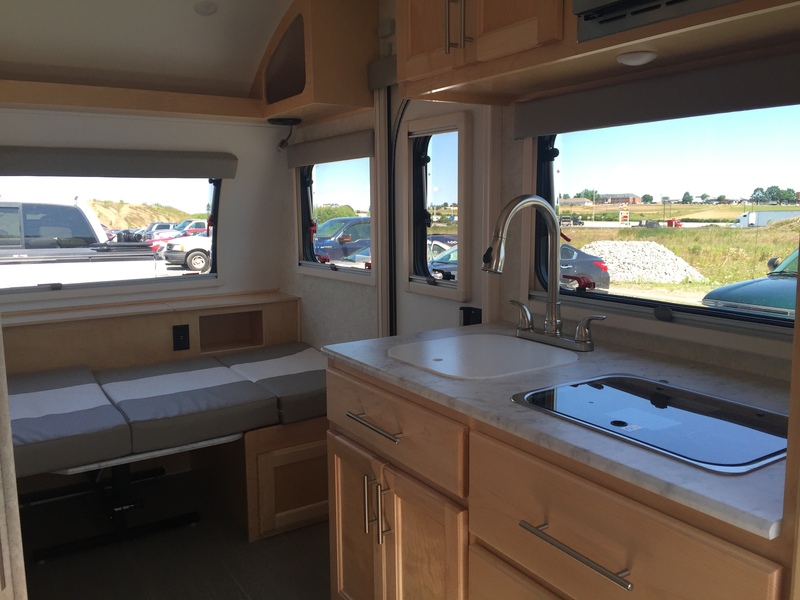 You really feel the space in the actual physical size of the Max, including an impressive 6’7″ ceiling height. 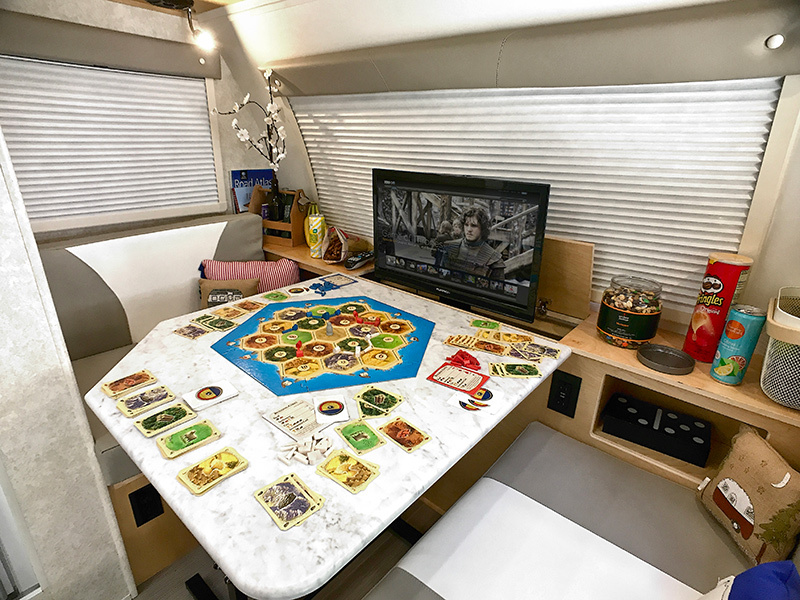 In addition, the light tones of the real maple hardwood cabinetry open it up to create such a refreshing environment that’ll rival the great outdoors for your time spent camping. 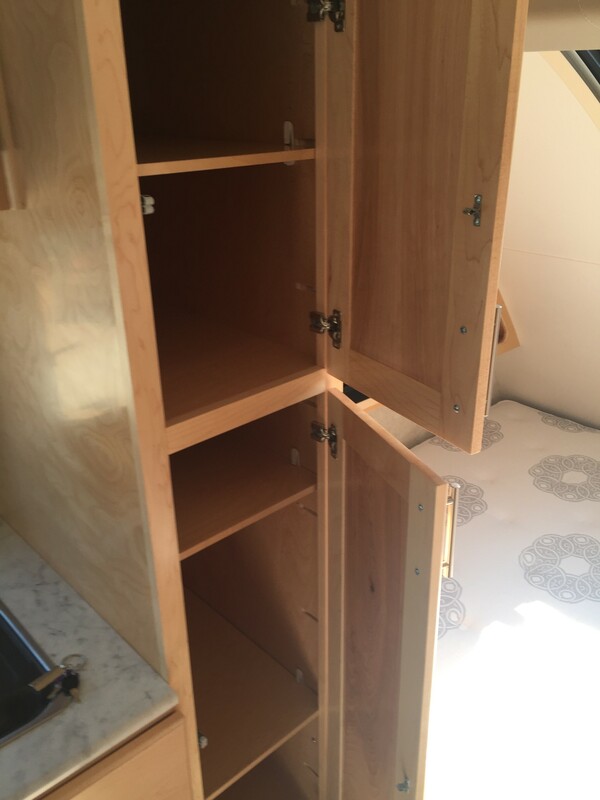 Space is also highlighted in the form of storage space. And for a trailer of this size, I don’t recall anything have the storage, and it’s smart storage, as the Max. 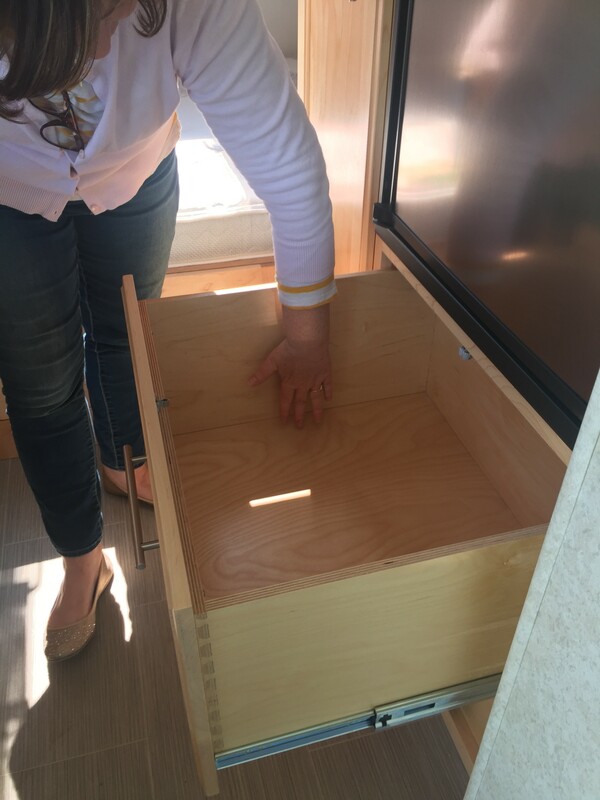 A total of two pantries, a deep drawer below the fridge, storage below both the queen bed and the front dinette, as well as three kitchen drawers, and overhead cabinets and cubby holes at every turn. 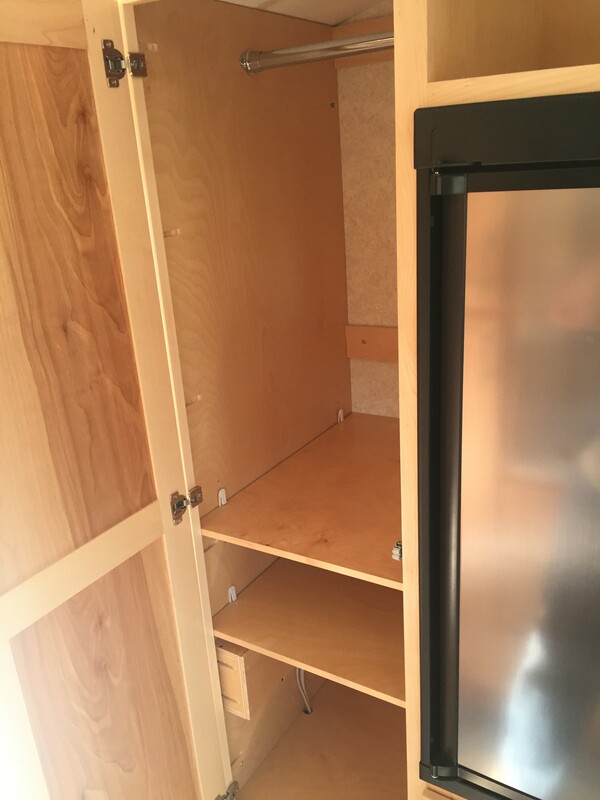 This doesn’t even cover the storage under and around the front dinette either, which there is plenty there as well. You’ll notice in the photo above the 24″ Furrion TV at the foot of the bed. 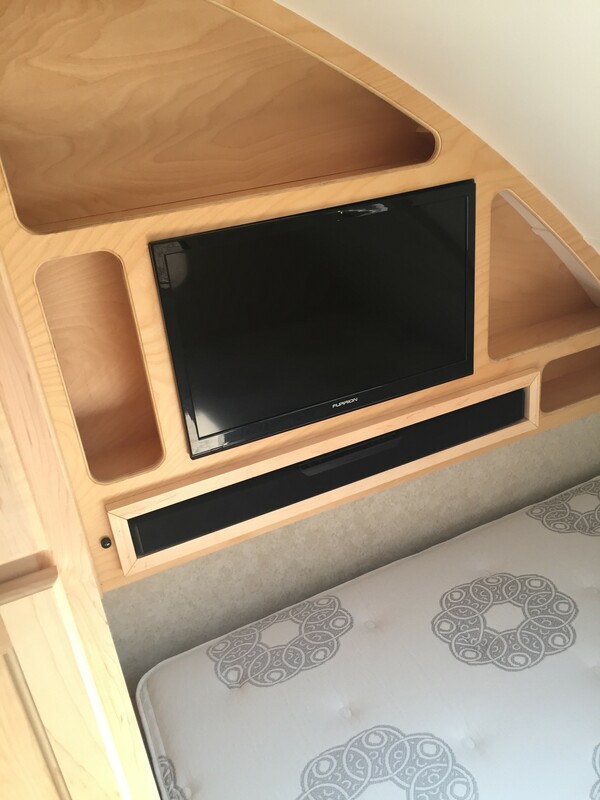 There’s also another Furrion TV concealed at the front dinette that opens up with the press of a button. 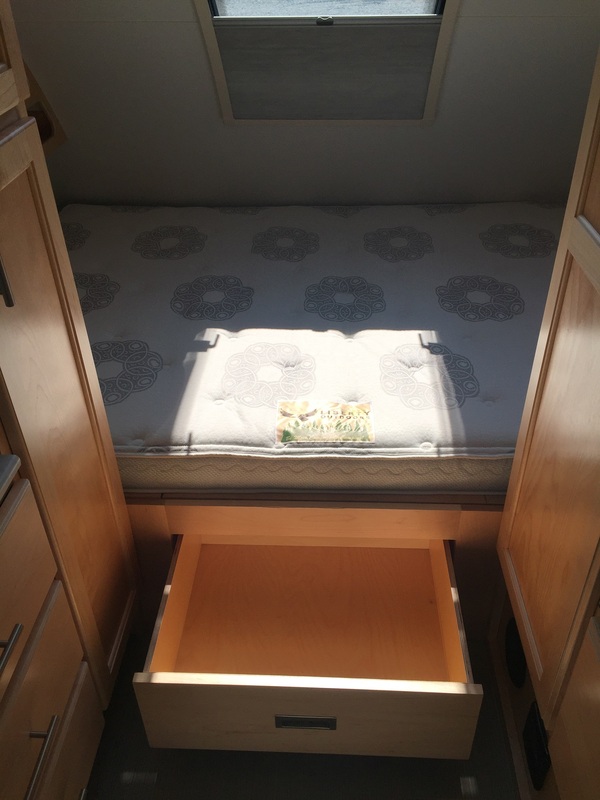 That front dinette also folds down to make a single bed, as typical in most RVs. As for construction, the Max is built quite a bit sturdier than your typical trailer in this class. First, it sits on a tubular steel frame that is powder coated to automotive standards. 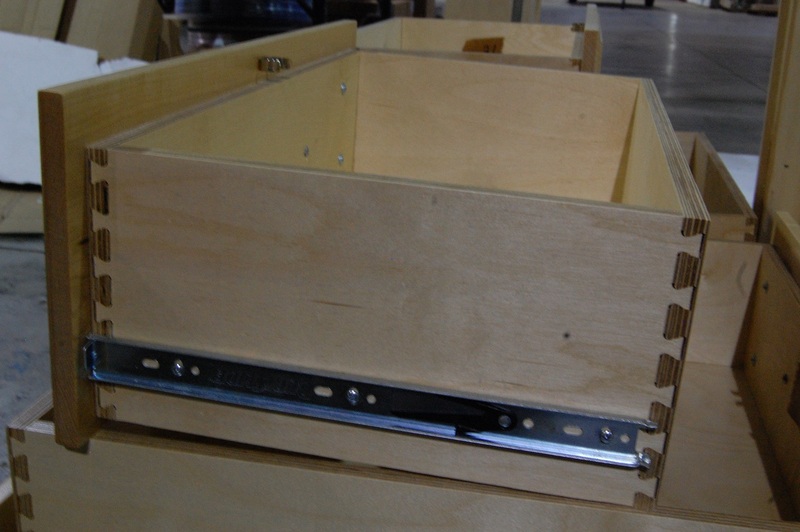 As is the case with most of the components Little Guy uses in production, the frames are locally built. The cage is aluminum and insulated with block foam insulation and covered by Azdel paneling. The one piece fiberglass roof and sidewalls can come in either a white or silver base, with exterior trim in your choice of black, silver, or red. 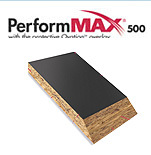 The floor is made of a 3/4″ thick product called PerforMAX 500, which is a wood product engineered to better withstand moisture and be more stronger and stable than plywood. 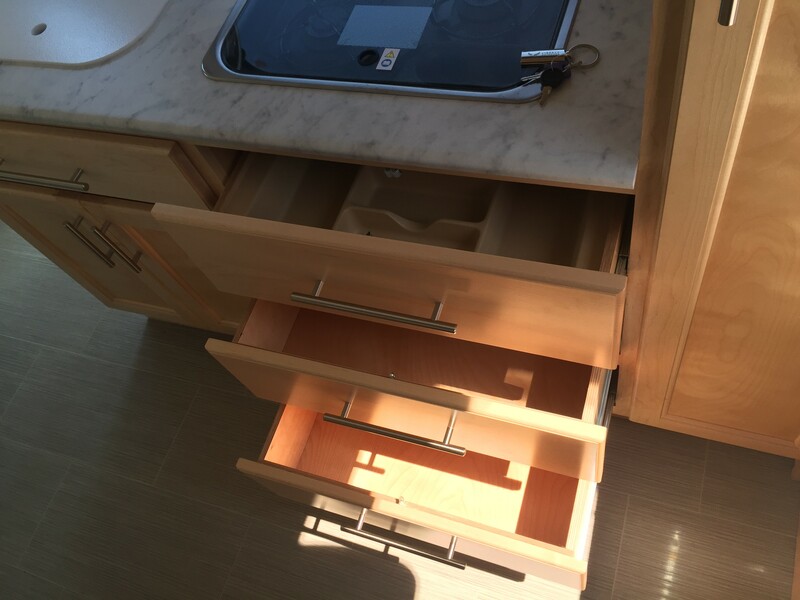 The construction really shines especially in the cabinetry. 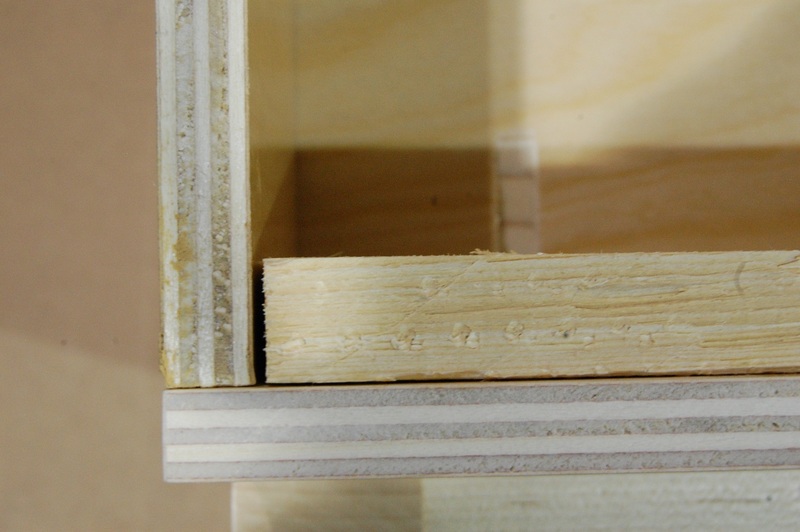 The dovetail construction used throughout is something you just don’t see much in the industry. I learned during my visit there that they’re building trailers to last you a long, long time. They have the confidence in their trailers that they’ve put a standard 2 year warranty on them, which in the industry is still the exception. 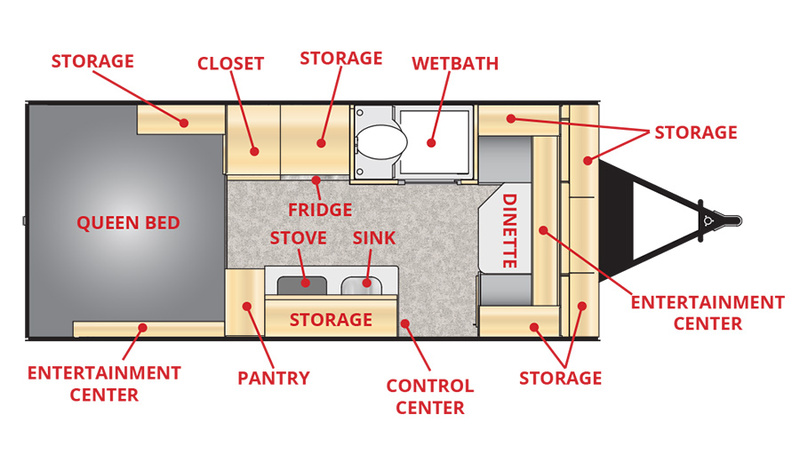 As for bathroom facilities, the Max has a wet bath with a height of a generous 6’2″, giving ample headroom for most. 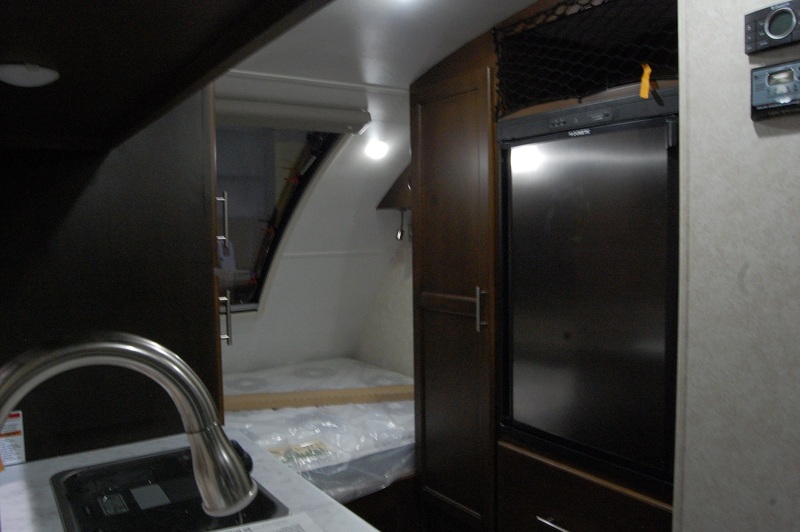 It also includes a full size multi-speed fan, which is a rarity when it comes to trailer bathroom vents. The standards on the Max are plenty, and things you wouldn’t even see as options on other trailers in this class. 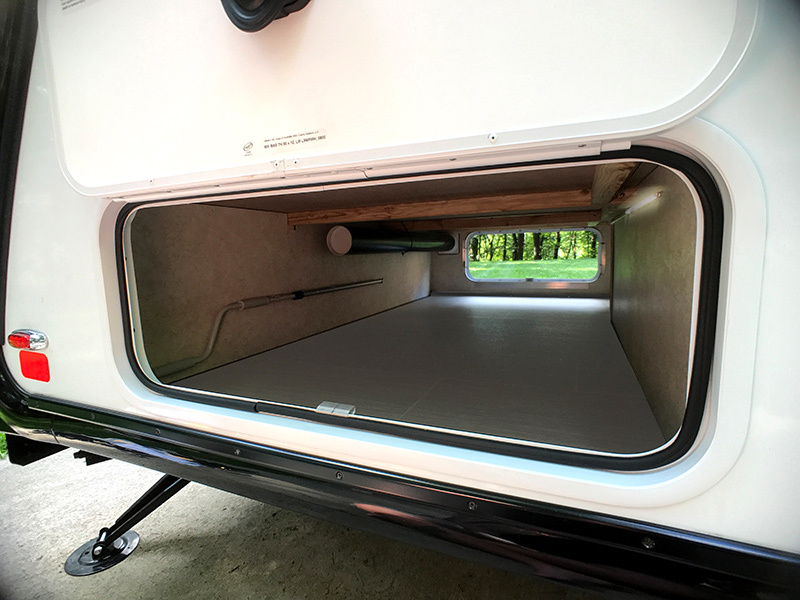 As for some of the exterior features, they include a 6’3″ Thule awning with LED light strip, 2″ rear receiver for the optional bike rack, 15″ aluminum wheels, sliding screen door, exterior speakers and TV mount, pass through storage with slam latch doors, illuminated aluminum entry step and illuminated grab handle. On the inside of the Max, you’ll find (aside from those features already mentioned), an 8″ deep stainless steel kitchen sink with residential style high rise faucet with sprayer, a flush mounted 2 burner gas stove with glass top, a stainless steel microwave, stainless steel 4 cubic foot stainless steel refrigerator, 13,500 BTU roof mount air conditioner, traditional 6 gallon Dometic hot water heater, LED touch screen and switch panel for monitoring tanks and lighting controls, LED lighting throughout including various accent lighting above cabinets, and Furrion Stereo, Bluetooth, MP3, MP4, DVD. As for standard specifications, the Max checks in with a dry weight of 2,900 lbs, tongue weight of 281 lbs, and is an even 21 feet long. The holding tanks are 20 gallon fresh water, 14 gallon gray water, and 9 gallon black water. Overall width is 7 feet and height comes in at 9’1″. There’s also an optional Rough Rider package you can buy that gives you a 3.5″ axle lift, black diamond plate, and 15″ matte black off road wheels and tires. The options on the Max are four: solar panel, bike rack, power tongue jack, and stained cabinetry, if you want your interior a little darker. Even though I’ve given you a lot of information here, chances are I’m probably forgetting a few things, which is testament to how loaded this “little guy” really is. It packs a feature punch that honestly I’ve not seen in a trailer this size in the years I’ve been doing this. While some will balk at the $29,999 MSRP, once you see one for yourself, you’ll soon realize that you’re not going to really find much on the level of the Max’s build quality and features. And that MSRP isn’t as high as other similar high end trailers within its size range. 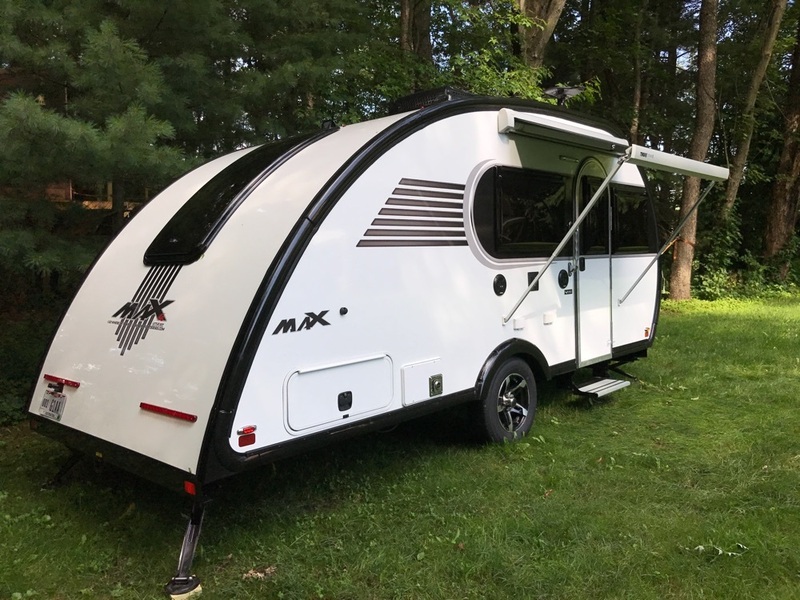 And from my visit to their factory, I would consider the Max a high end trailer that will last you many, many good camping years…and look pretty cool rolling into the campground to boot. Based on what I saw of the Max and the other projects set to come online in the next year, that bar will be raised even higher. Their story is just beginning. What appears to be a familiar situation Serro Scotty Worldwide president Bill Kerola would rather not be in, he faces the task of lining up a new manufacturer for the popular Serro Scotty HiLander. When one is acquired, this will make the fourth manufacturer of the HiLander since Serro Scotty Worldwide was formed in 2006. A few weeks ago, current manufacturer Cozy Travler, the HiLander’s manufacturer for less than a year, ceased production of their units, and along with it the HiLander. Kerola had an order over the winter for 20 HiLanders to be built to create a solid inventory at his Transfer, Pennsylvania dealership. However, that order wasn’t fulfilled and currently there are just a couple of 2012 HiLanders available between Kerola’s Camper Store and Randy’s Trailer Town in Collinsville, Illinois. In a phone conversation today, Kerola had just received word from a potential manufacturer in Indiana that they would not pursue building the HiLander due to the investment it would’ve taken to start building. 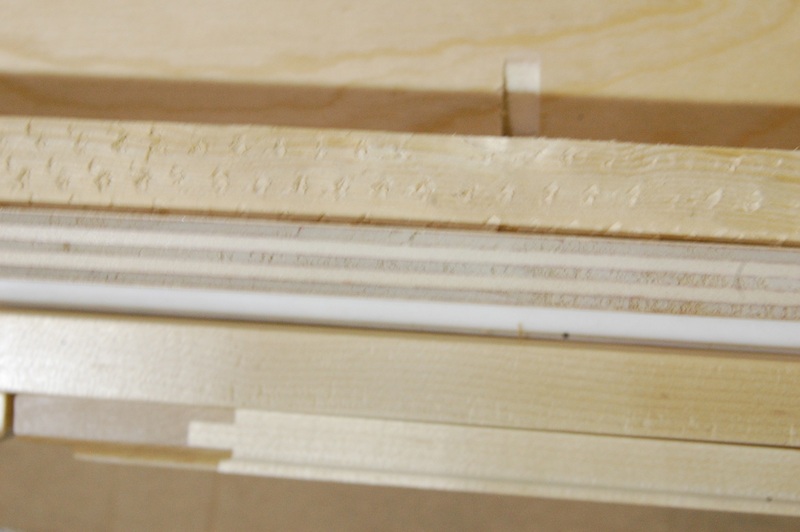 His next step in the process is to approach the manufacturer of his Serro Scotty Sportsman model, which is currently building the first prototype of the new design. It’s under construction in a section of the old FCTA plant in Somerset, PA, which is where Coleman pop-ups were last built before closing in January 2011. The crew is comprised of mostly former Coleman/FTCA employees. Should they choose to stick with building only the Sportsman, Kerola tells me he’ll then “hit the streets” to line up a new manufacturer. Taking production “in house” doesn’t appear to be an option just yet. Serro Scotty Worldwide general manager Tom Benedek explains, “It would take 150 units a year to make it work financially”. And demand for the retro travel trailers isn’t to that point. Where ever production of the HiLander lands, it will take approximately two months before they hit the market, due to engineering and getting familiar with them by the new manufacturer. The third unit in the Serro Scotty line, the Scotty Lite, continues to be built in central Florida by Trekker Trailers. We’ll have more on the story as it develops over the coming months.